Hi, I'm Joanne (yes you can call me Jo) and I live in the eastern suburbs of Melbourne with my husband, son Jake (6) and fur baby Molly (2). We enjoy time in the garden and walks in the parks, hills and bushland close to home and have become keen 'bird-spotters'. We also all love to paint or draw. My background is in the fields of Graphic Art, Desktop Publishing and Printing. I work part time (or full time when needed) in a Graphic Art and Customer Service roll at a local printer and spend most evenings drawing and working on this little business. I'm also a keen supporter of wildlife conservation and animal rights but you won't find me yelling about it waving a placard... in my own quiet way I try to bring awareness to these issues through my drawings and greeting cards. My main tools are simply coloured pencils and good drawing paper. I prefer Prismacolor pencils and smooth acid-free card. I have many canvases, boards and bits of timber waiting to paint on, but I find the pencils easiest to pick up and put down in the pockets of time I find for creating artwork. I produce greeting cards, calendars and prints featuring my wildlife art, printed on 100% recycled card. 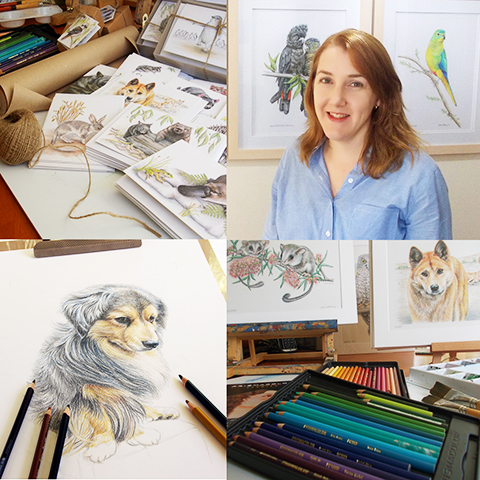 I also take commissions for portrait drawings of people, pets, animals and birds. I'm inspired by the amazing variety of creatures and faces we have on our planet and also draw inspiration from the many talented artists whose work I see around locally in galleries, shops and online. I have been drawing in some form or another all my life. Coming from an artistic family has helped to instill a love and appreciation of all kinds of art. I've always loved drawing people and used to draw celebrities from magazines as practice. When I started my own family I felt the need to take up the pencils and paints more seriously. To test the water, I offered to draw portraits of friends babies and kids and then more requests followed from there. I decided one Christmas to finally do something with some wildlife paintings I'd painted, and created a desktop calendar for gifts for friends and family... and after great feedback and encouragement from family and friends I set about printing the images onto cards as well. As for the Australian wildlife theme... well, I've always loved animals in general, but a documentary I once saw about our endangered Bilbies really struck me and since then have focused my attention on threatened species. There are just soooo many... so its quite interesting to research them and choose who to draw next. Pretty boring, but way back when I was doing a bit of freelance desktop publishing and graphics, I figured “ Jo's Desktop “ pretty much covered everything I did... though now it's more hand-drawings than computer-art that is produced from my desktop. I'm mostly self-taught, though have had classes in various illustration techniques way back when studying Visual Merchandising and Desktop Publishing. I've also since done the odd short course or workshop with local Tafes and art societies. I'd love more time to participate in the local art groups, but find I have a lot of contact with them by just working in around the creative Yarra Ranges community. The online communities including Madeit and for the artists Colour In Your Life are also fantastic for picking up hints & tips. Since I still feel like I'm in 'start-up' mode (only just stepped beyond 'hobby-business'), I can't really give any advice, other than: Research and chat to others in similar fields. I've found that most people are only too happy to share their knowledge. There is a wealth of knowledge online also. I've always been an organised person, and that helps heaps in keeping on top of things. No particular tips, but as I'm quite a shy person, I've found the online markets a great and easy way to get your craft out there. As for promoting your craft in person... you just have to take the leap and go out and show it to people. I finally did... and was pleasantly surprised at the response. It's actually easy if you're passionate about what you do. Having a stall at a craft market is a great way to get instant feedback and meet fellow crafters and customers. Online promotion seems to work best by keeping active on social media, groups and regularly updating your shop. I think you never stop learning and thankfully I haven't had any disasters, but I'd say that it does pay to be organised. As much as I love to create... if the suns shining, I find it very hard to sit inside and not get out there in amongst the trees. Its harder these days to find the time, but I do love to get out into the bush for walks or to visit a wildlife sanctuary... but a walk around the neighbourhood with our dog is just as good. Our local reserves are full of birds and beautiful gum trees. Music: Blues/Roots (John Butler), Coldplay, U2, Top-20, and I don't mind a bit of classical/world music. Wake up to the sound of kookaburras, breakfast outside in the morning sun, followed by a bush walk with my family. Afternoon painting or drawing with a cuppa and fresh baked cake handy. Bella Stationery Studio - Beautiful sweet watercolour designs on gorgeous paper goods.